Celtic's Aleksandar Tonev says he wants to put his ban for racial abuse behind him as the club continue to consider their options over the winger. The 24-year-old lost an appeal against the seven-match suspension for abusing Aberdeen defender Shay Logan. BBC Scotland understands that the Scottish champions are unlikely to take the Scottish FA decision to the Court of Arbitration for Sport. "All I can do is move on from this now," said Tonev in a statement. "I have made my case all along that I never used the words I was accused of using. "I say again that I did not do this, I know what I am and I am not a racist. "I want everyone to understand that, most of all the Celtic fans, who have been a great support to me since coming to the club." 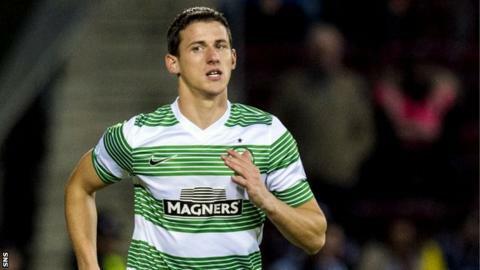 An October hearing revolved around Englishman Logan's complaint that Tonev had used the word "black" while swearing at him during a Scottish Premiership match at Celtic Park in September. Is an international quasi-judicial body established to settle disputes related to sport. Its headquarters are in Lausanne (Switzerland) and its courts are located in New York, Sydney and Lausanne. The decision to ban the on-loan Aston Villa midfielder was upheld on Tuesday by an SFA appeal tribunal, after Celtic manager Ronny Deila had vowed to take the case as far as possible to clear the Bulgarian. However, it now appears that the Glasgow club will not take the matter to the highest sporting court and instead are considering other options. "A lot has happened in the last few months," added Tonev. "It has been a very difficult time for me and everyone involved. "I know what happened and I know that I will definitely recover from this as a stronger person." The Bulgarian Football Association said it would continue to offer its full support to Tonev, adding: "Even though we are not aware of all the details during the investigation, we still believe in Tonev's innocence." Tonev served the first of his seven-match suspension before Celtic appealed and the next match for which he is eligible is against Ross County on 24 January.